In this activity, students are asked to identify the moon's phases by matching the picture in the left column with the description in the right column. An answer key is provided. 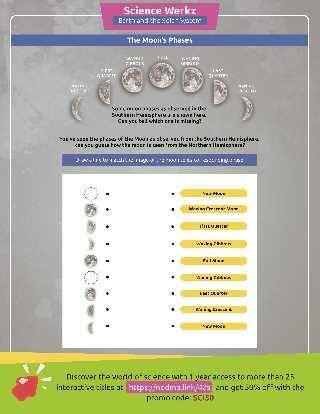 Teaching Tip: If desired, give students some additional background material by distributing this reading activity that describes the moon's phases. Get easy access to science learning from ScienceWerkz and get a 50% discount using the code SCI50.